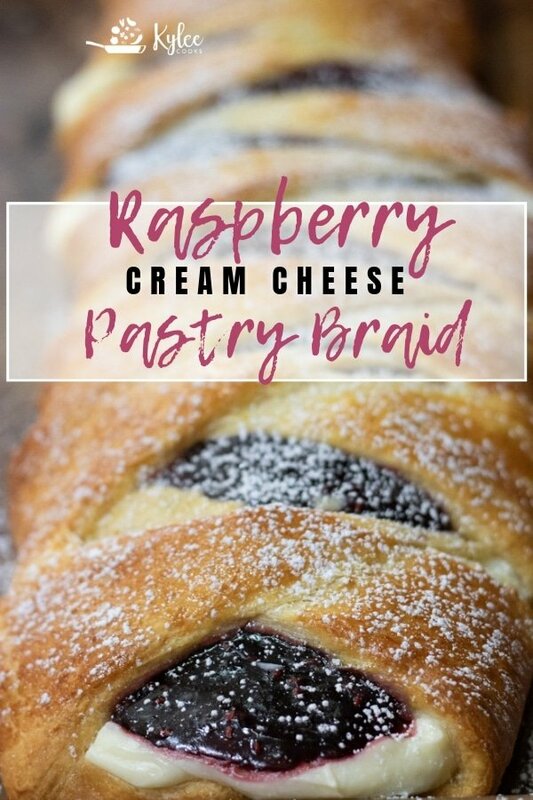 With a filling sweet cream cheese and raspberry, this pastry braid is a WINNER! It only takes 5 minutes to throw together, 20 (ish) minutes to bake, and you have a pretty looking and delicious tasting pastry to cut and share. The husband tells me I can make this anytime I want – isn’t that kind? 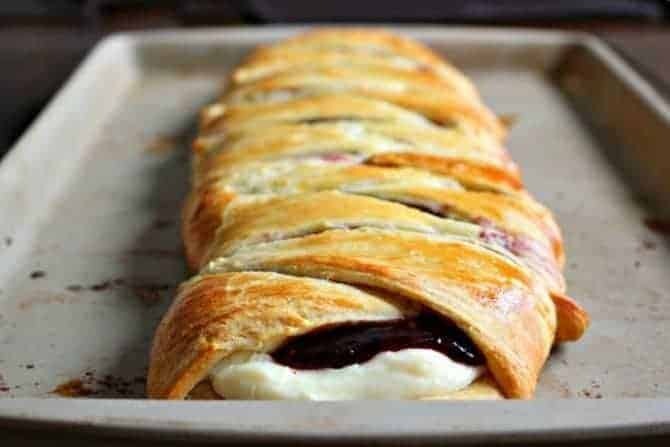 He’s a huge fan of baked goods, and although this does use canned crescent rolls (ie, I did not make the pastry myself), I can’t think of a better way to use them than this. This mixes up and comes together super fast, and tastes like you stopped by a french patisserie. It’s SO easy to make. 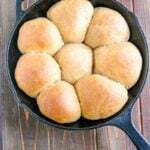 Just lay the rolls out (shown below), mix up the cream cheese and powdered sugar, and dollop on the raspberry pie filling. Braid it up, egg wash and bake!! Can you even IMAGINE the look on your family’s face if you pull this out of the oven as they drag themselves into the kitchen one morning in search of food? Open both cans of crescent rolls, and place triangles of dough with points on the outer edges and short edge in the middle. Use a roller to flatten center. Mix cream cheese and powdered sugar and spread on the center of dough. Use a small cookie scoop to do a line of pastry filling down the very middle (cream cheese will be twice the width). Bring dough points over in braid pattern and secure on other side. Brush dough with egg , and bake for approximately 20 mins (check at 18 minutes). Slice it up, grab a plate and a fork – and DEVOUR! Place triangles of dough with points on the outer edges and short edge in the middle. Use a roller to flatten center. Pull it out of the oven…. Using pastry filling vs pie filling is KEY. Pie filling will spread and ooze out of the braid, and create a very delicious, but still, pretty big mess. Change up the flavors! Apple pie filling, with a dusting of cinnamon sugar on the outside before baking is sooo good! 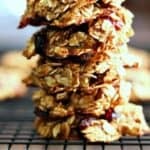 Want more easy breakfast baked goods? 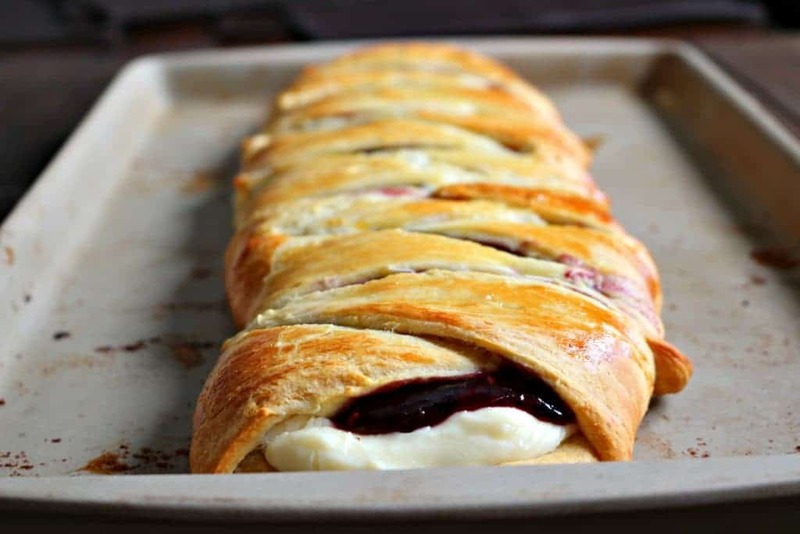 WANT TO TRY THIS RASPBERRY CREAM CHEESE PASTRY BRAID? PIN IT TO YOUR BREAKFAST, BRUNCH OR TREAT BOARDS! 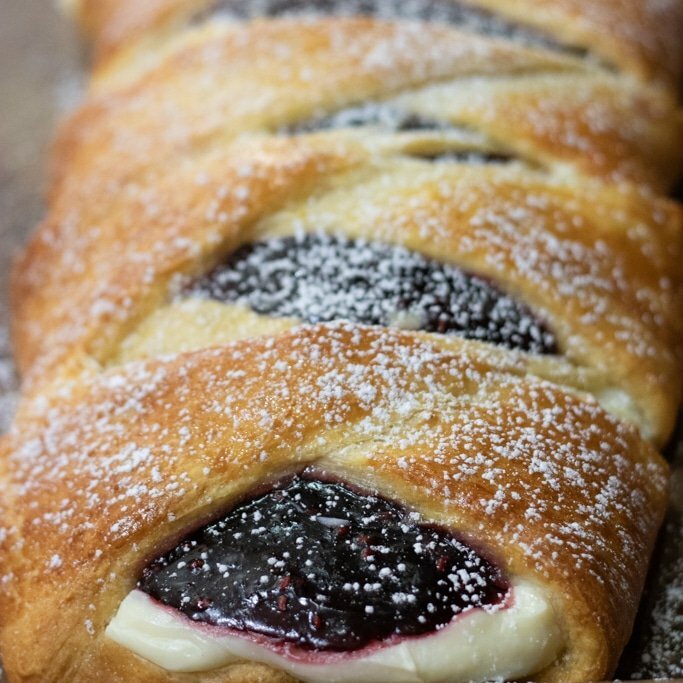 With a sweet cream cheese and raspberry filling, this pastry braid is a WINNER! It only takes 5 minutes to throw together, 20 (ish) minutes to bake, and you have a pretty looking and delicious tasting pastry to cut and share. Slice it up, grab a plate and a fork - and DEVOUR! Oh my gosh, can we trade husbands? Mine doesn’t like cream cheese. I love it though, and this looks amazing! Pinned to make for brunch this spring! How can anyone hate cream cheese?! This looks so good! I love cream cheese and raspberry together. The video is awesome too. You make it look so easy! Pinned because I will DEF be making this later! Thanks, Taylor! It is so easy, and looks like it took much longer than it does. I bring it to brunch parties, or just make it on a weekend when we have company. Or when we dont. Lol. 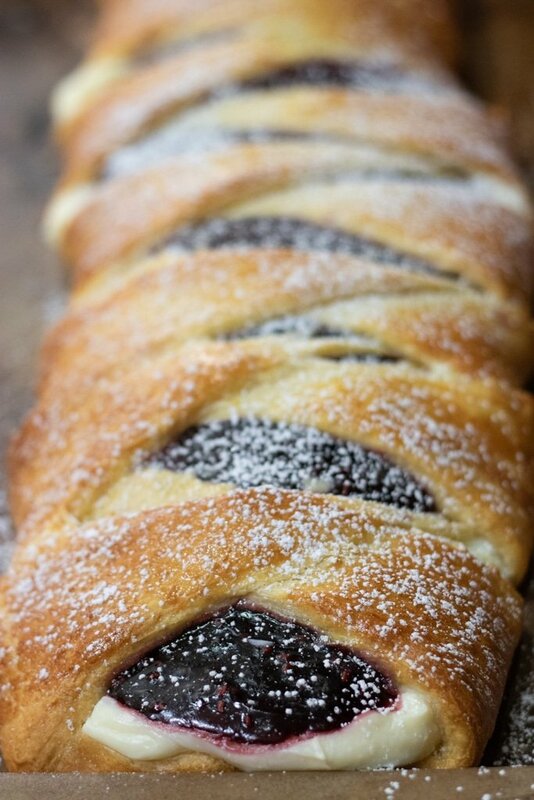 I need to bring pastry to our Easter breakfast at church….this will be it!! Oh my gosh this looks incredible and SO simple! Definitely making this this weekend, thanks for sharing! This looks so easy to make! And delicious. And pretty. Perfect combination in my book! Ohhhhh my god. That looks FANTASTIC. I’ve never made pastry like that before, but you make it sound easily achievable – love! I love this braid! Pinning and sharing! This would be so great with some coffee! 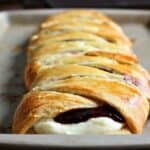 This looks good..i love creating new recipes using pastry sheets and this one looks good. Nice and simple recipe. I loooooove cream cheese! And I’ll bake this braid like tomorrow! I have been meaning to make a pastry braid for the past few months but just haven’t gotten around to it. 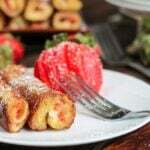 This recipe sounds amazing plus that raspberry cream cheese filling sounds delish right now! I need to make danish ASAP. Looks delicious! Ok this is one for my list! It looks so easy and yet perfectly presentable. I’m going to give this a try at the weekend. 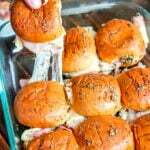 Great pictures that walk you easily through making this and it looks delish!!! Pinning it! This is genius! It looks so good and professional but it doesn’t take hours and hours to put together! I am definitely trying this soon! 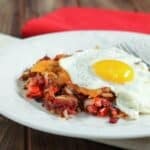 Yummm… This looks so good and easy to make too! I can’t wait to try this recipe!! Brilliant! Not only did you do a fantastic job of showing us photos for each step, your finished product looks very professional (you know, like it took hours to make) and delicious. Yum! ? I love any pastry with creme cheese and fruit and this looks magically delicious! I also can’t believe how simple it seems to make. Thanks so much for the step-by-step photos! My favourite stage is devour haha this looks lovely and not that difficult to make either so thats a bonus. this is definitely on my list! sounds easy enough to make ! my daughter would love this! Just wanted to say this was amazing. I made it for Easter and people were fighting for 2nds lol. looks yum, should give this a try. .have a nice weekend. Could I add some cornstarch to the pie filling so it won’t run? No, if you’re using pie filling – it will not run.